EUDOXIA DE BARROS was born in Brazil, in the city of Sao Paulo, from a traditional Brazilian family. Her father, Joviniano de Barros, was from Piracicaba and her mother, Maria Antonietta de Campos Barros, from Braganca Paulista, two cities in the heartland of the State of Sao Paulo. Even though Eudoxia's parents were not professional musicians, they loved music in general and had great interest in the Brazilian culture. Since her childhood, Eudoxia was undoubtedly influenced by this environment, always cultivating a great love for her country but also showing her appreciation for the culture of other nations. From a very early age Eudoxia devoted special attention to the Brazilian composers embracing the mission of influencing the national artistic midst. She used to say: "Someday I will be able to hear our Brazilian music being played all over the world!" And today she can certainly verify that her dream is almost coming true. In 1984 Eudoxia established with her husband and other composers the Centre for the Brazilian Music (Centro de Musica Brasileira), a non-profit organization that promotes concerts and competitions dedicated exclusively to the Brazilian music. "The Society for the Brazilian Music (Sociedade Pro-Musica Brasileira) presented in its 2nd Soiree the recital of the pianist Eudoxia de Barros. By doing so this new association reaffirms the purpose of devoting itself to the Brazilian music. Its motto is Mario de Andrade's assertion: 'What the Brazilian music really needs is to be studied and loved by our musicians'. Mario de Andrade (the Brazilian writer of the play Macunaima who strongly fought for the idea that the Brazilian art should be lively, strong and capable of giving the precise and most evident dimension of the authenticity of our national origin and culture) would be delighted to hear Eudoxia de Barros: a Brazilian pianist playing in a very Brazilian way the works by Brazilian composers. And this seems to be the main attribute of the young pianist Eudoxia de Barros, who has a Brazilian soul and is so rich in talent. According to Euclides da Cunha, one of the greatest Brazilian writers, not only the sertanejo (that is, one who lives in the remote interior of Brazil) - considered to be the most authentic of the Brazilians - is a strong element in the Brazilian culture; the Brazilian art is also very powerful. It predicts the Brazilian people beginning to awake, bringing to the whole humanity a contribution of peace and social justice, perhaps with no equivalent in the history of the world. We have been accumulating resources for this mission for 500 years: a strength that explodes in Portinari, Villa-Lobos, Euclides da Cunha, Mario de Andrade and Guimaraes Rosa. This is the transfiguring force that makes the Brazilian music a magical affirmation of the national genius so well represented in the works by Villa-Lobos, Camargo Guarnieri and Lorenzo Fernandes. This force emerges all of a sudden in this young pianist, not only in her but also in all our cultural heritage and artistic past. It is remarkable how Eudoxia de Barros dominates the piano from a technical perspective. Even more interesting is how she is the master of an aesthetic concept of the pianistic interpretation that is perfectly identified with the creative expansion of the Brazilian music. We had never heard Eudoxia de Barros playing before, so the Eudoxia de Barros we met today is for us the interpreter of the Brazilian music. The Brazilian music is as demanding as any other music and since Eudoxia de Barros is a great interpreter of the Brazilian music, she is a great pianist. Very few times I felt so fulfilled, artistically speaking, than when I listened to her, playing this repertoire of Brazilian music that seemed composed specifically for her. On the other hand, Eudoxia de Barros has an indefinite indescribable quality - depicted by Camoes in his famous poem - that although being erudite recalls the fundamental Brazilian pioneers and finds its highest expression in Ernesto Nazareth. This quality, the characteristic of a creator, is totally evident in Eudoxia de Barros who is the interpreter. We still have to praise the courage of the pianist Eudoxia de Barros (something I did not believe could really exist, except in a kind of literary musical prose commonly found in concerto programs) that brings out the very soul of the piano. The color, the energy, the nuance and the lyricism that she draws from the instrument is also intense. It is true that the high level of the program favored Eudoxia de Barros' magnificent presentation and that night everything contributed to give the Brazilian music the high concept it deserves. Eudoxia de Barros answered Mario de Andrade's plea with body and soul, embracing the Brazilian music with love and study. It is good to know that there are still Brazilians in Brazil, that is, people who defend our threatened culture precisely because it is original, crossbred and new. This is the case of Eudoxia de Barros. This is the case of the Society for the Brazilian Music. And humbly this is our case". Eudoxia de Barros feels rewarded for her devotion to the Brazilian music by the almost one hundred scores dedicated to her by many Brazilian composers. Eudoxia also felt rewarded when she was elected in 1989 to join the BRAZILIAN ACADEMY OF MUSIC (founded by Villa-Lobos) where she occupies seat number 14, in honor of Elias Alvares Lobo. On September 3, 1982 Eudoxia married Osvaldo Lacerda, one of the best and most appreciated Brazilian composers (with whom in the past she studied theoretical music subjects such as Theory, Harmony, Analysis, Counterpoint and some aspects of Composition). Osvaldo Lacerda dedicated to Eudoxia a great number of works but one of them - Cromos for piano and orchestra, a very original and beautiful piece - gets her special affection and she intends to divulge it throughout the world. Eudoxia performed Cromos many times, conducted by: Diogo Pacheco (with the Sao Paulo Symphony Orchestra), Claudio Ribeiro (with the Porto Alegre Symphony Orchestra), Luiz Fernando Malheiro (with the Sao Paulo Municipal Orchestra), Lutero Rodrigues (with the Cultural Symphony Orchestra, during the Campos de Jordao Festival-1999) and Henrique Morelenbaum (with the Petrobras Pro-Musica Orchestra). (The soundtrack of Cromos is available in this website). "Twenty years ago, writing about Magda Tagliaferro after one of her recitals in Recife (Brazil), we had the opportunity of classifying the pianists (and of course this classification is valid for other instrumentalists). There are four categories of pianists: the ones that play to satisfy their parents; the ones that enjoy to play well the piano (and try hard to do it); the ones that have a great talent but not an imperious vocation; and the artists who have a clear and fascinating vocation, to whom music is an essential need, an almost mystic way of communion with the world. It happens that to the pianists of the last category, playing with strict fidelity to the scores is almost impossible because they have a strong personality and in all performances they imprint their individuality. Interpretation is re-creation and has the collaboration of the interpreter; two different people do not see the same landscape in the same way; the written work waits, as it is said, for the vivifying breath of the spirit. Magda Tagliaferro belongs to this last category, and so does Eudoxia de Barros whom, by the way, was her disciple. Evidently, and to avoid erroneous interpretation of what we just affirmed, we are far from advocate excessive liberty that could completely disfigure the composer's work. But without certain independence, the interpreter would never reach the core of the work. After a recital full of technical difficulties the young artist Eudoxia de Barros played some extras, including the extremely hard Etude n.1 by Chopin, magnificently performed". "I consider extraordinary Eudoxia de Barros' disposition in choosing precisely Villa-Lobos - Concerto n.1 for piano and orchestra - as the composer to be presented in her first performance with full orchestra in Rio de Janeiro last Sunday at the Rex. A young girl (she is only 16 years old), Eudoxia de Barros is already in love with the music of our great composer. She came from Sao Paulo especially for this presentation and performed with a convincing technical poise that places her in the right track for a triumphant career with study and love for the music. It is difficult to play Villa-Lobos not because he is violently modern, since many times he appears as a romantic extremely poetic, but because of the technical exuberance of all his work. A single melodic phrase is not all that matters, although it emerges as a secondary element that nevertheless fascinates and pleases. At the concert last Sunday, Eudoxia de Barros showed a formidable interpretation revealing precious temperament, agility well practiced and conviction of the work she played. A new talent arises under the good sponsorship of the JMB (Juventude Musical Brasileira)!" "I am sure that Ms. Eudoxia de Barros will be, in a very short time, the most appreciated Brazilian pianist. I register here my compliments for her magnificent performance of Villa-Lobos' Concerto". Eleazar de Carvalho's prediction became reality. Every year Eudoxia travels throughout Brazil and abroad, performing 50 to 60 recitals/concerts. It is a true social work: her task is to present music, knowledge and joy to all her public, young or old, learned in music or not, poor or rich… At the end of the year, she traditionally performs at the Municipal Theater of Sao Paulo and she strongly recommends to the City Hall to offer tickets free of charge thus permitting access to all public, aiming the non-elitism of music. Eudoxia crosses Brazil from North to South and East to West. In many cities she was the first artist ever to present a recital. Since 1976 Eudoxia developed what she calls a didactic recital, which audiences have found quite interesting: she briefly explains some of the main characteristics of the composers and their music before playing them. She chose this path after participating on a TV program of questions and answers at Rede Globo (Brazil), hosted by Paulo Gracindo. She came to enjoy addressing the public and started the didactic recitals. At the above mentioned TV program, Eudoxia answered about Ernesto Nazareth, a Brazilian composer she rediscovered in 1963 during the celebration of the centennial of his birth, when she recorded the anthological LP Ouro sobre Azul. This record was a bestseller and was awarded the "GOLDEN RECORD". Since then Eudoxia includes Nazareth in all her recitals. Almost all Brazilian pianists and some from abroad followed on her initiative. It is noticeable that from 1963 on, thanks to Eudoxia's divulgation of Ernesto Nazareth and other Brazilian composers of the same genre of music, there was a revival of the Choro in Brazil. "I also presented in Rio de Janeiro the release of the record Ouro sobre Azul (Chantecler International, HI-FI, CMG1017) with works by Ernesto Nazareth performed by Eudoxia de Barros. It includes the following pieces: (Side 1) Ouro sobre Azul (tango), Sarambeque (tango), Elegantissima (waltz), Tenebroso (tango), Labirinto (tango), Coracao que sente (waltz), Fon-Fon (tango) and Bambino (tango); (Side 2) Batuque (batuque), Apanhei-te Cavaquinho (tango), Confidencias (waltz), Carioca (tango), Escorregando (tango), Duvidoso (tango), Eponina (waltz), Odeon (tango) and Brejeiro (tango). It is also enriched by an explanatory note written by Mozart de Araujo, an expert in Ernesto Nazareth's work. First of all I was impressed by the high level of the interpreter of this record, Eudoxia de Barros, one of the best young pianists in Brazil nowadays. She comes from Sao Paulo, the same city that gave us some of the greatest Brazilian pianists: Antonietta Rudge, Guiomar Novaes, Souza Lima, Yara Bernette and Ana Stela Schic. Eudoxia de Barros deserves a lot of credit: when she first came to Rio de Janeiro, the whole program of her recital was dedicated to works composed by Camargo Guarnieri's pupils. She performed all those cheerful pieces by heart and very seriously as if they were already part of her repertoire. Later she recorded this program (I did not hear the record yet). Eudoxia de Barros' performance of the Concerto n.2 for piano and orchestra by Camargo Guarnieri (with the Brazilian Symphony Orchestra conducted by Guarnieri) was also dazzling (recording by Ricordi, SER-4). When I heard that this illustrious young artist, Eudoxia de Barros, recorded works by Ernesto Nazareth, I was neither surprised nor amazed by its great success. Eudoxia's comprehension of the Brazilian music was evident when she performed the disciples of that "posterity" to which I referred when I mentioned the work of Father Jaime Diniz. Furthermore, not too many people had the opportunity to hear Nazareth or his contemporary interpreters playing. We know that Nazareth's composition talents were unparalleled by any other popular composer in Brazil or - and this I affirm till someone proves me wrong - in the whole world. Even so, as Darius Milhaud felt and wrote, there was something insaisissable (that is, something very difficult to identify) in Nazareth's performance of his own music. After Nazareth and some of his contemporaries (like Henrique Vogeler) died, only the scores survived and the interpreters have to deal with them. I noticed that almost all pianeiros (that is, pianists who play popular music) are not able to play Nazareth. Exception is made to Carolina Cardoso de Menezes. The good pianists from the past did it: Arnaldo Rebello, Mignone, Radames Gnatalli, Mario de Azevedo, Aloysio de Alencar Pinto; more recently: Homero de Magalhaes, Gerardo Parente, Murilo Tertuliano dos Santos and others. Some of them were closer to the traditional Nazareth; others gave valid and interesting own versions but far off the nazarethian orthodoxy. In her performance, Eudoxia de Barros brought together her outstanding technique, her remarkable ability of study (before studying any music she first precisely finger marks and makes notes on the scores - as I saw for myself), her lively temperament and her extraordinary musical intellect. Before she recorded Nazareth's works, I heard Eudoxia de Barros playing them at Ricordi, in Sao Paulo. She convinced me immediately - this recording is a model of purity and virtuosity; it is vibrant and has new sounds, as in the lows of the Batuque, almost ever strongly percussed, dealt efficiently by Eudoxia de Barros through the pedal and keys lightly touched. It is very impressive the way she performs the low sounds with great conviction, that is, the nazarethian rhythmic so rich and exciting, and the admirable regularity of the viola-like accompaniment of Apanhei-te Cavaquinho and Ameno Reseda. In my opinion, three pieces stand out from the others in terms of technique, revealing the superiority of the music not only instinctive but carefully analyzed and eminently artistic (in this field, Nazareth can even be compared to many erudite composers): the waltz Confidencias, the very 'carioca' (that is, original from Rio de Janeiro) tango Carioca, and the most perfect of Nazareth's waltzes Eponina. Tenebroso, considered to be the 'king' among the Brazilian tangos, is one of the most beautiful guitar-like nocturnes ever written. This is really a matter of preference, since all the pieces are played with clarity and emotion. In the nazarethian discography, where the arrangements and the illegitimate accompaniments abound, this Chantecler recording has also a didactic importance: it is a Nazareth without additions or trivial ornaments. It is understandable why the illustrious educator Eulina de Nazareth wanted to watch (even standing up) the first audition of this recording. Later in her speech she congratulated the initiative and thanked Father Jaime Diniz for the great tribute to the work of her eminent father, represented by his excellent book". Always sure of what she wanted, Eudoxia de Barros' trajectory of ceaseless studies had the following phases: lessons in Sao Paulo with Mathilde Frediani (her first teacher); with Karl Heim (a disciple of Kempff, to whom Eudoxia owes the definition of her career as a professional pianist. When she was eight and a half years old this teacher, astonished with her progress, asked her what were her intentions regarding her piano studies. "What do you mean?" - she asked. He explained that she could play the piano for her own pleasure only, or teach, or go around the world playing at theaters for many people. "That is what I want to do, the last one that you explained!" - she answered, irrevocably sealing her destiny); lessons in Sao Paulo and in Paris with Magda Tagliaferro and her assistants: Nellie Braga, Lina Pires de Campos, Daisy de Lucca and Olivier Bernard; lessons in Sao Paulo with Guilherme Fontainha, Camargo Guarnieri, Sebastian Benda, Roberto Sabbag, and a few lessons with Arnaldo Estrella, Yara Bernette, Bruno Seidhoffer and Sequeira Costa. In France, she studied with Pierre Sancan, Christianne Senart, Pyotr Kostanoff and Lazare Levy. In the United States she had as teachers Olegna Fuschi and Howard Aibel. Eudoxia went to the United States with a fellowship to teach at the North Carolina School of the Arts in Winston-Salem, NC from 1965 to 1967, invited by the composer Vittorio Giannini. In Germany she studied with Walter Blankenheim. After several years of public performances and teaching experience, Eudoxia wrote a book about piano technique: Tecnica Pianistica - Apontamentos sugeridos pela pratica do magisterio e concertos, published in Portuguese by Ricordi (it can be ordered by e-mail ricordi@ricordi.com.br or by phone 55-11-3331-6667). Several of Eudoxia's students won national piano competitions. Eudoxia recorded 31 LPs mainly by Chantecler and also by Ricordi, Alvorada, Marcus Pereira, Orpheo and Comep. She has 10 CDs, available by e-mail eescala@terra.com.br or by phones (055--11) 2275-0834 ou (055--11) 5535-5518 (visit www.correiomusical.com.br). Eudoxia performed all over the world. In France: in Paris, several times at Salle Gaveau; in Bourges; at the Chateau d'Artigny; at the Chateau d'Isenbourg. In Switzerland: in Lausanne; in Geneva; in Puilly. In England: in London, at the Canning House. In Portugal: in Porto. In Mexico. She played several times in Colombia, Ecuador, Peru, Paraguay, Bolivia, Honduras, Panama and Nicaragua (at the centennial of Ruben Dario); all these recitals in Latin America were organized by the Itamaraty (Ministry of Foreign Affairs of Brazil). In the United States: in Houston, in Miami, in Chicago, in Asheville, in Cleveland (as a soloist with the Cleveland Philharmonic Orchestra under Jose Serebrier). She also performed in several cities of North Carolina as a soloist with the North Carolina Symphony under Benjamin Swalin, after being awarded by unanimity the 1st prize of a competition promoted by this orchestra to be its soloist during the season 1966-1967, playing Rhapsody on a Theme by Paganini by Rachmaninoff. She also played in New York: at the Town Hall and at the Carnegie Hall; and in Washington, DC. 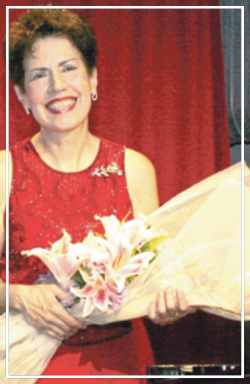 More recently Eudoxia was awarded "BEST RECITALIST of 1997" by the prestigious Associacao Paulista de Criticos de Arte. In Porto Velho, RO (Brazil) Eudoxia was honored with a street bearing her name at the Loteamento Nova Caiari - II. Since 1993 Eudoxia is a member of the ACADEMY OF MUSIC OF PERNAMBUCO (Brazil). In 2009 she received the "Comendation of Merit Anhanguera", the highest award granted by the government of the state of Goias, Brazil. Recitals 1 -> eclectic program with two parts: one dedicated to international music/composers and the other dedicated to Brazilian music/composers. To be performed in Theaters, Churches, Universities, Schools of Music or Conservatories. Recitals 2 -> light program. To be performed at Conferences/Seminars, dinner parties or outdoors. Concerts with orchestra -> traditional or Brazilian repertoire. Private lessons -> to students of every age and level; regular studies and/or preparation for qualification tests or competitions. Workshops/Master Classes -> for teachers or students; may include an explanation on the several steps in the career of a pianist, how to study a new music, comments on the most common mistakes made by piano students, audition by students or whomever wants to perform. Duration: 3-4 hours. Conferences -> Subject: "The Brazilian composer Ernesto Nazareth"; with optional audition by students performing Nazareth's works (or works by other Brazilian composers of the same genre of music). Duration: 3 hours. Conferences/Workshops -> Subject: "How to study in an emergency…"; with optional audition by students. Duration: 3-4 hours.